With a cut capacity of 1-5/8 inch for cutting 2x dimensional lumber, the M12 FUEL 5-3/8 inch circular saw, delivers up to 170 cuts per charge and up to 2X the motor life of competitive products. With the ability to cut a wide range of common jobsite materials, the M12 circular saw was designed to deliver the power, run-time and durability required by professionals. The POWERSTATE Brushless Motor outperforms all leading competitors with constant power output, yet runs cooler with no wearable components. REDLINK PLUS Intelligence ensures optimized performance and protects your investment from overload, overheating, and over-discharge. The M12 REDLITHIUM XC4.0 Battery Pack provides more work per charge and more work over the life of the pack than competitive batteries.The M12 FUEL 5-3/8 inch circular saw features a built in LED light for great cutline visibility and all aluminum guards and shoe for increased durability on the jobsite. The SCM 18-Volt Lithium-Ion Cordless Metal Cutting Circular Saw delivers fast, smooth cuts for most metal cutting applications. This Hilti tool and blade combination cuts everyday materials like strut, threaded rod and rebar, plus the system will take on demanding applications like back-to-back strut or thick steel with ease. The ferrous metal cutting blade (included) is designed to deliver more cuts per charge. Cut more metal and move around the jobsite with this durable and portable Hilti cordless saw and blade combo. The SCW 18-Volt Lithium Ion Cordless Circular saw delivers high performance for the toughest working conditions. When you need to move from application to application, one floor to the next, you need a smooth, long-running cutting machine like this to complete your job. Primarily designed to cut wood and plastic, this circular saw will help you outperform and outlast past work performance. Add the Hilti SCW 18-Volt Cordless Circular Saw to your jobsite today. 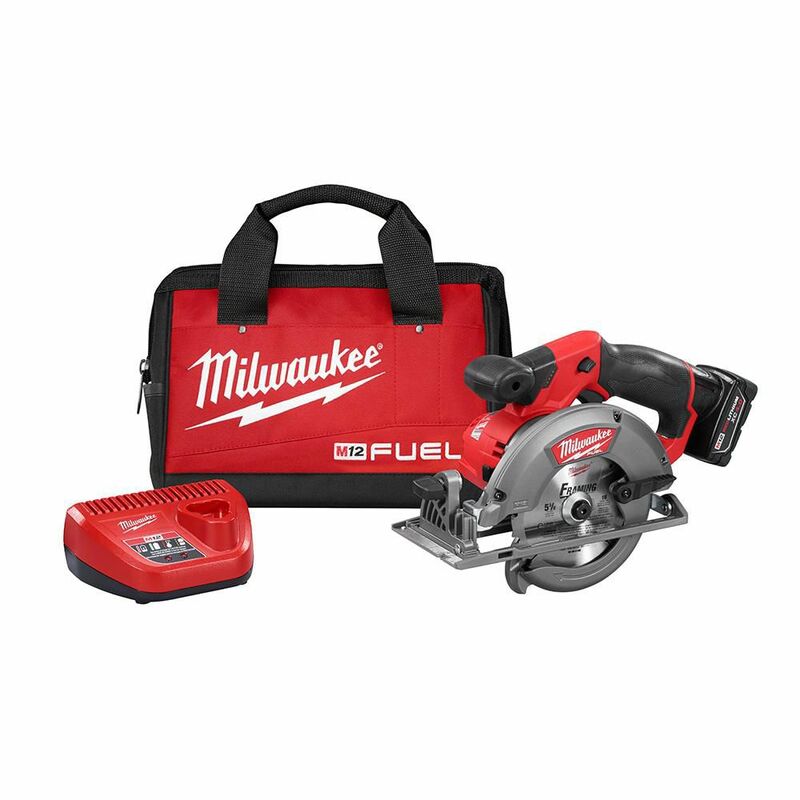 M12 FUEL 12-Volt Lithium-Ion Brushless Cordless 5-3/8-Inch Circular Saw Kit w/ 4.0Ah Battery & Bag With a cut capacity of 1-5/8 inch for cutting 2x dimensional lumber, the M12 FUEL 5-3/8 inch circular saw, delivers up to 170 cuts per charge and up to 2X the motor life of competitive products. With the ability to cut a wide range of common jobsite materials, the M12 circular saw was designed to deliver the power, run-time and durability required by professionals. The POWERSTATE Brushless Motor outperforms all leading competitors with constant power output, yet runs cooler with no wearable components. REDLINK PLUS Intelligence ensures optimized performance and protects your investment from overload, overheating, and over-discharge. The M12 REDLITHIUM XC4.0 Battery Pack provides more work per charge and more work over the life of the pack than competitive batteries.The M12 FUEL 5-3/8 inch circular saw features a built in LED light for great cutline visibility and all aluminum guards and shoe for increased durability on the jobsite. M12 FUEL 12-Volt Lithium-Ion Brushless Cordless 5-3/8-Inch Circular Saw Kit w/ 4.0Ah Battery & Bag is rated 4.7 out of 5 by 23. Rated 5 out of 5 by HomeDepotCustomer from Perfect for what I needed done!... Perfect for what I needed done! Rated 5 out of 5 by Bill from Very handy. Not too heavy. Plenty of power. ... Very handy. Not too heavy. Plenty of power. Rated 5 out of 5 by DK from Great Saw!! After getting what I needed this year in the way of a cordless 7 1/4 in. saw, I went ... Great Saw!! After getting what I needed this year in the way of a cordless 7 1/4 in. saw, I went looking for something a little lighter, smaller and more nimble. I actually passed this saw over at first, maybe it was because of the 12v system or something, thinking I wanted an 18 or 20v unit. So I tried a couple other brands, and after giving them close examination, ended up returning them for one reason or another. They were either awkward, or too much plastic, especially the blade protecting shoe. My local Home Depot has always been great about handling returns, which I really appreciate. I bought my first one of these on 8/29/2018, and after receiving and using it for awhile I was really impressed. Typical Milwaukee build quality, and metal in ALL the right places. So taken back as to how well the unit worked, I ordered a second one on 9/4/2018. The M12 power system is more than adequate for this unit. I actually find my self using these more than I though I would, and not necessarily just as a Trim Saw. I did replace the stock blades with the Diablo brand, looking to keep a 16-18t framing blade on one, and a finer finishing blade on the other. Ready for just about anything. Rated 5 out of 5 by Dominick from This unit is light and powerful. I just finished trimming... This unit is light and powerful. I just finished trimming new rail cap boards on an 8' x 18' deck, followed by a 300 sf engineered wood flooring job without changing the 4.0 Ah battery. I am very pleased with my purchase. Rated 5 out of 5 by Bruce from Excellent for light jobs. ... Excellent for light jobs. Rated 5 out of 5 by AG from Bought to build 10x16 poool house. I've been using it... Bought to build 10x16 poool house. I've been using it to for 2x6 (some pt), 1/2" plywood, and PVC trim using a diablo blade. I love it! I have adjusted height, mitered on 45, and changed the blade all work very well. I picked up my corded Dewalt and it felt so heavy in comparison. Recommended 100%!